Before Fukuoka’s shiny Momochi-area landmark Fukuoka Tower was built, the city had another bay-side landmark in the older, more industrial Hakata Port area. The modest-sized Hakata Port Tower, completed in 1964, is now eclipsed by many of the apartment and office buildings that have sprung up in the city’s ensuing growth, yet it still manages to retain its own unique brand of retro-style charm. 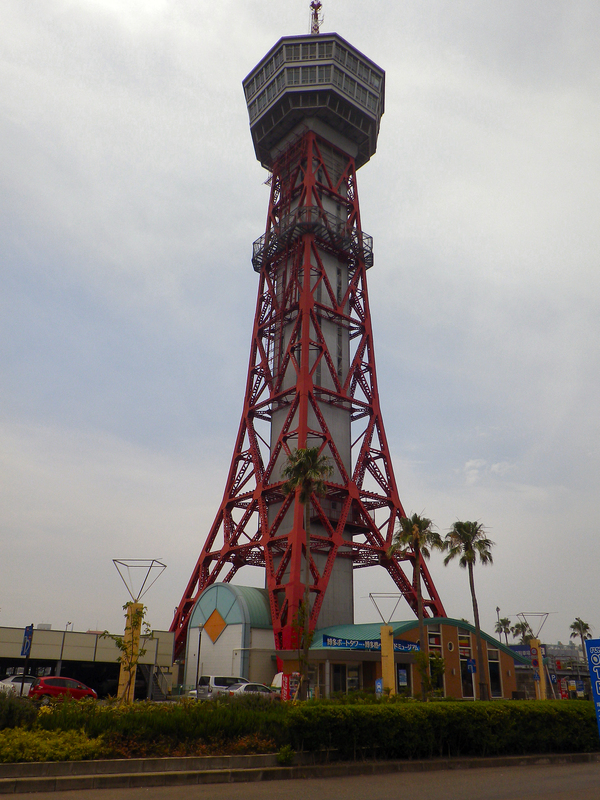 It stands 100 m (328 ft.) tall and was designed by architect Tachu Naito–the same architect who designed Tokyo Tower, Osaka’s current Tsutenkaku Tower, and Nagoya TV Tower. Furthermore, Hakata Port Tower is the first thing that both domestic and international passengers see when arriving in Fukuoka by boat. The tower is not overly impressive, but it has a certain retro-style, down-to-earth feel that makes is strangely attractive. It can be quite pleasant at night when illuminated and accompanied only by the sound of waves lapping against the wharf. Although it is hard to imagine this tower being a central landmark in the city, it is important to remember that Fukuoka used to be much smaller than it is now, and the city’s rapid rate of growth simply left Hakata Port Tower in the dust. Bayside Place Hakata is a small but charming shopping complex located next to the tower and the local ferry terminal (the international ferry terminal is only a short distance away). It boasts a fair assortment of shops (including duty-free shops), and a large aquarium adorns the entrance area. Although Bayside Place isn’t worth going out of the way to see, you can combine it with a visit to the tower or grab a bite to eat and buy souvenirs before departing by ferry. Sightseeing boats also connect this complex to Tenjin Central Park. The tower is free to enter, and it is open from 10:00 a.m. to 10:00 p.m. Hours for Bayside Place vary by shop, but most are open from around 9:30 a.m. to 11:00 a.m.
To get to both facilities, take bus 46 or 99 from the Hakata Station area (220 yen, 20-30 min.) or bus 49 or 90 from the Tenjin area (180 yen, 10-15 min.) to Hakatafuto bus stop. Ferries and boats also provide connections to Tenjin Central Park, Uminonakamichi Seaside Park and Saitozaki, Shikanoshima Island and other destinations. It is also possible to walk from Gofukumachi Station (Hakozaki Subway Line) to either facility in about 20 minutes. 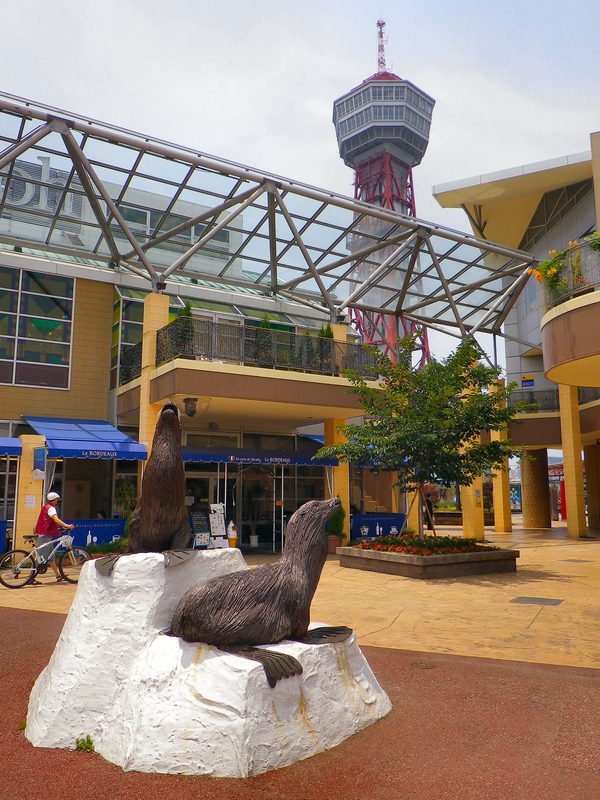 This entry was posted in Sightseeing and tagged bay, bayside, Bayside Place, ferry, Fukuoka, Fukuoka blog, Hakata, Hakata Port Tower, Japan, Kyushu, Kyushu blog, landmark, Naito Tachu, port, port tower, sightseeing, Tachu Naito, tourism, tower. Bookmark the permalink.